Welcome to BMX Bike Games! Our site features a collection of the the top BMX and biking games. Enjoy! If you're looking for the best online BMX and bike games - whether to kill time while you are waiting for your class or office shift to finish, to keep boredom at bay during a rainy afternoon, you will surely find it here at BMXBikeGames.net! Yes, BMXBikeGames.net is your one stop spot for the best and most exciting BMX and bike games that deliver pure 100 percent fun straight to you and your computer! It doesn't matter if you are all grown up and have kids, if you are a teenager who revels in doing bike stunts, or if you are just introduced in the world of online gaming, BMXBikeGames.net has something for everyone! Don't know where to start? Can't seem to make up your mind which of the BMX and Bike games showcased here is for you? These games can be played by anybody! BUT if you want nothing BUT the best of the best of bike and BMX games, here's my tip: Check out the Top 10 online bike and BMX games we showcases here. Updated on the regular, you will find excellent additions to the site that will keep you busy and glued...and of course having truckloads of fun for the hours to come! Free Rider 2 - this is for the players who love to create their own tracks and own levels riddled with obstacles! In this online bike game, you can create your very own open-ended tracks, paths for the racers, launching ramps, and everything else in between! To make the deal even sweeter, you can save it, share it, and race through tracks that other players made! 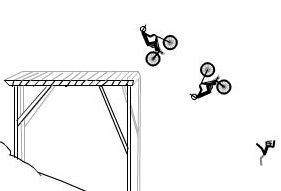 BMX Master is one of those classic stunt games - it made it to our top 10 list and for very good reason! With time challenge and championship mode, this game will bring out the biker in you. Whichever mode you choose means FUN! And the graphics are great too. Easy navigation, intuitive interface, interesting game play - but let me remind you this bike game can be challenging even for seasoned pros! Or, if you're dreaming about creating your own bike team, then Drag Bike Manager 2 is yours for the taking! It's like the Sims version of biking and BMX games. You will go head to head with the best racers in town. As you progress, you earn cash. Use the cash wisely though! They won't be there forever. Start off with buying another bike, purchasing upgrades, and ultimately - build your team of racers and BMX Empire! Teens and young adults, most especially, find Drag Bike Manager one of the BEST BMX Games online they can lay their hands on! And those are just some of the gems you will find right here at BMXBikeGames.net! So stop staring at this screen! Check out the site (the Top 10 to begin with) and start having fun!